This has been an incredible project that John has achieved building and crafting the cabin all by himself. He had lots of offers of help but he wanted to enjoy this personal challenge and put his carpentry and life’s practical skills to the test. It has been a very satisfying and rewarding experience for him although exhausting at times, which has spanned 6 months with every free moment of his time and weekends in between working with clients and going about his daily business and activities. A great example of loving dedication, strength, creativity and pride the results are truly a work of art. Part of the work has been restructuring the garden with the removal of a dead tree, existing plants have been able to blossom and grow and with new flowers planted it is a fantastic time of year to enjoy nature so very lovely. It is all so gorgeous, so it is perfect to name the cabin “Peace Haven” as that is what it is. 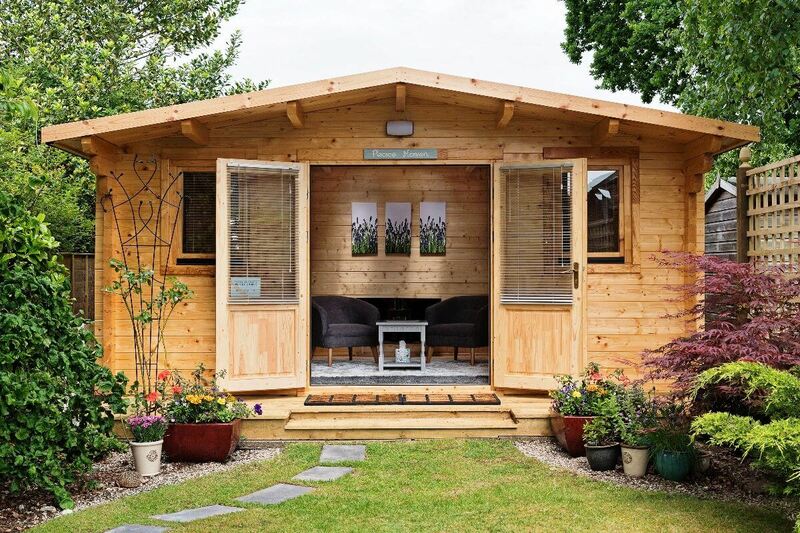 We took great care between us to furnish the cabin to create the most calm and relaxing environment possible to further an experience of deep peace, calm and tranquillity, a wonderful place away from the everyday stresses and anxieties of everyday living. We wanted to establish a feeling off relishing rest – a retreat to recharge energies and promote healing both inside and outside the cabin. We believe we have achieved this – so come and find out for yourself, either for a blissful Reiki treatment, hypnotherapy session, counselling, coaching, training course, workshop, group activity or supervision – you are of course most welcome! To see the full history of the building of the cabin in pictures stage by stage from start to finish see our Facebook Business page Swans Therapy Bournemouth. Apart from the Peace Haven, we also have a Private Counselling Room in the main house which we use for certain therapies and treatments.